A theory of business and social change takes me further in my understanding…. On retreat in Queensland, I read a book co-authored by Otto Scharmer that explored his theory of organisational and societal change, named Theory U. One of a range of theories that use a “U” shaped path to explain change, Scharmer’s grabbed my attention for its depth and spiritual resonance (Indeed I now understand that Scharmer’s particular take on “U” was based on a range of reflective prior works by other scholars). I noticed that Scharmer explained some of the spiritual resonances of his theory by drawing strong parallels to great spiritual paths, particularly Buddhism, Hinduism and mystical aspects of the Hebrew faith. Yet I (not really surprisingly by this stage) could also draw very deep parallels to the way I was now understanding the Christian story. Put very simplistically, Theory U notes that change which identifies a problem at A and tries to implement an immediate fix to get to B is not sustainable. Such a change does not reflect adequately on the essential character of the entities (people, places, things) involved in the scenario. In Scharmer’s words, it is not “present” to the whole situation. 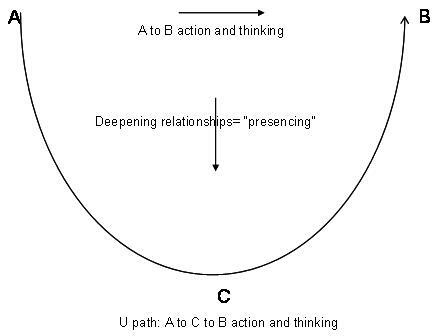 Only when we can become more present to the characteristics of the situation - that is attempt to go through C – can we begin to implement authentic change that has health giving (whole) results (see diagram 1). As I say, this is a grossly simplistic explanation of Scharmer’s logic, but does not drastically misrepresent his point. The A to B represents a modernist, mechanical paradigm with an assumption that things can be acted on “objectively” to solve problems. The A to C to B path realises that there is not really such a thing as “objectivity.” The actor is always part of the journey of change and is being acted on as much as acting. To adapt the language of George Lakoff - the cognitive linguist - A to B thinking is about strict fatherhood. 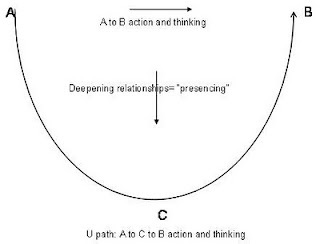 The A to C to B path is about nurturant community.